You might know the feeling. The one of hurrying down an urban sidewalk and suddenly finding yourself stopping, head turned in an upward gaze at a massive work of art. It can be awe-inspiring, encouraging, thought-provoking. A mural leaves an impression, a sense of place. An experience like this shapes our memories of place — the sense that lingers with us when we walk away from the mural or visit a restaurant, boutique shop or gym. What sort of impressions are we creating of Downtown San Diego? In August of 2017, we hosted place-making expert, Fred Kent. Nearly 100 people joined us for a workshop led by Fred and his team to challenge our conceptions of how we, as a community, can utilize public spaces to best meet the needs of the community. It wasn’t about constructing another building or paving paradise to put up another parking lot. Instead, we asked how we could activate existing spaces to create an ambiance where communities can live, work, play and thrive. A blank wall can become a movie screen. An office terrace unused on the weekends can be filled with yoga mats on Saturday mornings. A mural installation can become a place where residents and visitors stop and really take stock of the place they’re in. It’s easy to talk the talk, though. Which is why the Partnership is teaming up with Humphrey Consulting and RAD Lab (the guys who brought us Quartyard) to introduce CANVAS. It doesn’t stand for anything — there’s no cutesy acronym — a canvas is a starting place. It’s an invitation to stop and consider; to dream, to create. Thus, Canvas says something about how we view Downtown San Diego. The neighborhoods that make up Downtown are each uniquely equipped with a sense of identity and character, some more developed than others. The goal of Canvas is to improve these neighborhoods by capitalizing on the existing, latent and potential identity and character already present. Canvas seeks to turn spaces, which are easily forgettable, into places that are tailor-made to the needs of those who shape each neighborhood. Additional light can make pedestrians feel safer as they travel (and thus more likely to do so). Planter boxes can make an urban jungle feel less imposing and more like home. Murals and painted utility boxes can turn dull slabs of concrete into opportunities for people to actually enjoy the community they are present in. A vital part of the Canvas program is space activation. Residents and visitors need a reason to stay and play — an opportunity to shape the character that is their neighborhood. 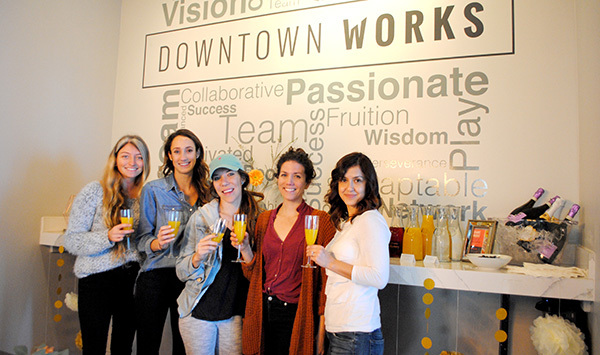 Canvas kicked off 2018 by hosting a free “Manis & Mimosas” event, utilizing the premier space at Downtown Works in the Columbia District. Yes, you read that correctly — free manicures and mimosas. We also hosted a trivia and board game night at Mission Brewery in conjunction with Downtown game enthusiasts, Switchboard Games. And you’ll see more of these events throughout the year. Taste new cuisine with friends at a pop-up brunch event in Marina (we know San Diegans like to brunch), or take your kids to see their favorite movie in a cozy, outdoor, urban atmosphere. We don’t want to just talk the talk. We don’t want the dreams and ideas of the 100 community members who joined us last fall to go undeveloped. We don’t want the input of residents who have joined us at our Clean & Safe community mixers to go unheeded. Downtown is a great canvas to start with. We hope the community members, the ones who really shape the identity and character of our neighborhoods, participate with us as we continue to make San Diego America’s Finest City. 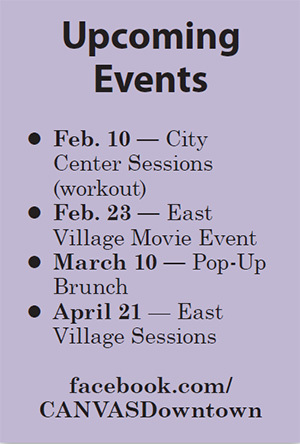 Follow our Canvas Downtown Facebook page for upcoming events. We’ll see you around.